It’s no secret that I love to start my day with a bowl of homemade granola cereal, but with numerous ingredients involved and a whopping 75 minutes to bake, the reality is this just isn’t a breakfast I always have on hand. Especially with all the traveling we’ve been doing this summer, I’ve had to get creative with quick and easy alternatives when away from home. 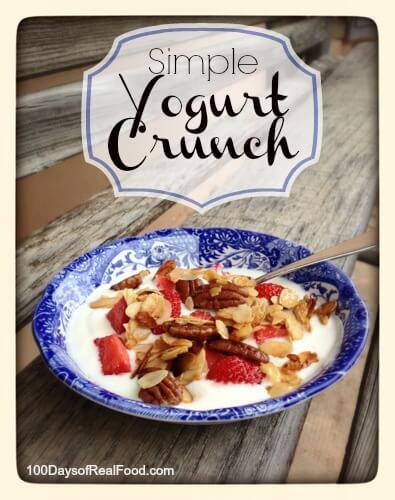 So I am excited to share my second favorite breakfast with you today…Simple Yogurt Crunch! This is such an easy dish and the heartiness of the nuts will keep you feeling full all the way until lunchtime (unlike most breakfast cereals, which are often made from refined grains that are not filling). I also want to make sure you know about our sponsor, Plan to Eat. They created an ingenious little website that gives you a place to store all of your recipes (from websites, blogs, and your own collection), select what recipes you’d like to make each week, and then automatically create an organized grocery list with all the required ingredients from those recipes. 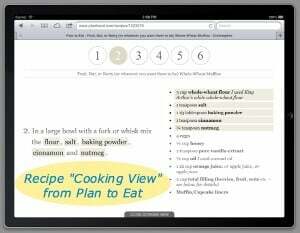 They also recently launched a new feature called “Cooking View.” It puts your recipes into one standardized format on your tablet (or device) that walks you through each step with large text and numbered buttons that help you easily advance through the recipe instructions (see screenshot attached). Be sure to check out this great 1 minute video to see exactly what Plan to Eat has to offer…and don’t forget to try out their free 30-day trial! In a medium sized bowl mix together the yogurt, 2 teaspoons of the maple syrup (or honey), and vanilla. Divide equally between 2 or 3 cereal bowls and set aside. In a medium sized saute pan over medium heat melt the butter. Add the nuts to the pan and stir until well coated. Drizzle the maple syrup (or honey) over the top and cook until lightly toasted (i.e. brown) for about 1 to 2 minutes. Nuts can go from perfect to burnt very quickly so it's important to remove them from the heat as soon as they are ready. Spoon equal amounts of the nut mixture onto the yogurt bowls, toss a handful of berries on top, and serve. Enjoy! I make something similar to this everyday for breakfast except I don’t toast the nuts and I add raw oats. It is super yummy! ! I go to my local Cash and Carry (Restaurant Supply). Buy disposable hot bowls with lids. Measure out my oatmeal, nuts, dried berries and sweetener ahead of time. So when on vacation, I just add hot water. So yummy and healthy compared to the premade ones you buy in the stores or coffee shops. Yum! I’ve been looking for something like this for the same reasons (just don’t have the time and the inventory staples to make granola in the summer!). Can you make a bunch and store it? Becca – The nuts might not be as crunchy, but you could try it. Let me know how it turns out! I made extra and stored it for almost a week in an airtight container on the counter. It wasn’t quite as crunchy as the first day, but equally delicious. I used chopped almonds (because I did not have sliced on hand), which I think may have helped it keep crunch longer than had I used sliced. Thanks for another great recipe! I have to comment on your sponsor … Plan to Eat is AWESOME!!! I checked it out after you posted about them on Facebook and I am just thrilled to pieces with this system! I now subscribe to Plan to Eat AND MOMables. Thank you, THANK YOU for taking the time to really check out potential sponsors before taking their money and advertising for them. It’s obvious that you only recommend quality products and services, and that quality products and services are drawn to your blog for that reason. I saw a recipe on Fb for something similar and easier. Not that this isn’t good I’m sure! It’s 6oz plain yogurt (Greek or regular) 1/4 cup oats and whatever fruit you desire. Mix it up and refrigerate overnight. I add a little honey to mine just before eating. It’s so yummy! The possibilities are endless too! I’ve done berries, peaches, and bananas with a sprinkle or two of cinnamon. I’m sure nuts would be a good addition too! Yes, thank you Katrina…that is right. We focus on eating a variety of whole foods and stopping when we feel full. It sure does put the fun back into eating again! The main reason I don’t eat commercial yoghurt is that it is revoltingly sweet (the ones with fake sweetners are even worse!) so I get plain yoghurt and just put berries in it. You don’t need any added honey or maple syrup, in my opinion, fruit makes it sweet enough. I’ll have to try adding nuts, too. 1/2 cup any kind of berries or a mixture or other frozen fruit such as peaches, pineapple, mango, etc. Place all ingredients in a blender jar and blend until smooth and thick. Enjoy! *A large batch of these mix-ins can be made ahead and then 1/2 cup of the mixture used for each smoothie. Whenever I run out of homemade granola, I make something similar and I call it Faux Granola. Buttered, salted pecans or walnuts, toasted coconut, whatever dried or fresh fruit and sometimes raw cacao nibs. I’ll use the same mixture over warm porridge in the winter. Yum! I’ve always loved plain yogurt so ill have to try this! This sounds yummy! 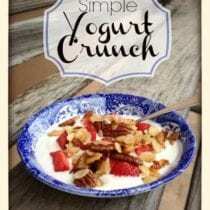 The perfect morning granola+yogurt combo! Thanks for the recipe! Since I’m lactose intolerant, I use this recipe to reduce my dependence on milk and cereals. Hi Lisa, I just wanted to let you know that I tried this recipe this morning & it was amazing! It went well beyond my expectations. I now have a new go to breakfast. Thank you! This sounds really great. What are your thoughts on Greek yogurt? I think Greek yogurt is fine as long as it is also plain (and preferably whole milk and organic as well). Lol! The picture was so nice and the way the name of the recipe is at the top, I actually thought you were talking about a cereal you found that met the rules!! I was trying to find out how a pre-made breakfast cereal with yogurt could be “unprocessed”!! :D:D Ah, that was funny. Thank you for the recipe! I have been dragging my feet on the granola front as well. It just disappears so fast too! Thanks Lisa for the recipe. Great job! I do a similar yogurt thing for lunch with raw nuts and frozen mixed berries. Never thought to eat it for breakfast. 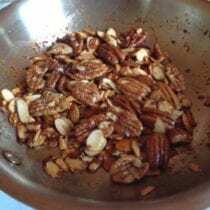 I prefer pecans, but usually just use walnuts because they are cheaper and a good source of Omega-3’s(when raw). I can’t wait to try slivered almonds and raw oats. Yum! Where, oh WHERE do you find whole fat organic yogurt? I *never* see any in Target, Food Lion or WalMart… That’s almost it for grocery shopping in my small hometown. I was beginning to think nobody makes whole fat yogurt. I have found that most “budget” stores like Walmart or even Target don’t carry stoneyfield or at least don’t carry the whole milk or cream on top variety. If you’re really interested in whole fat yogurt and your choices are that limited I would really suggest making your own. It’s easy to do and with just a little prep you can make yogurt while you sleep! Before I bought a yogurt maker I would make it in qt sized mason jars on the counter with a heating pad. Google it, you’ll be amazed how simple it is!! Wendy, I agree with Veronica…I make yogurt in the crockpot (no yogurt maker) and it is super easy. It ends up being a little more than half the price of what I would buy at Trader Joe’s and I like it so much better. And Publix down here in the south!!! For breakfast, I’ve been eating “Bob’s Red Mill Muesli” with coconut milk and a spoon of chia seeds. I let it sit for about 10 min before eating. Quick, easy and filling. I have this for breakfast every morning. Either in a bowl or make a smoothie. I use Almond milk instead of milk and if smoothie I add a cup of greens (any kind- I prefer Kale, Spinach, etc. )to get veggies in too. Just made this! Super easy, delicious and satisfying. Thank you for sharing this! Made this this morning and loved it! What a great healthy breakfast option or even lunch. I have been trying to find good yogurt recipes and this looks like a pretty tasty one. It also has a good balance of protein and carbs perfect for a healthy diet. Most of us consume way too many carbs without realizing it. It is very easy to do. And consuming the right amount of protein daily will not only help to slim us down but it builds muscle mass too. This was pretty decent and I do feel full. In oprah this month, you have a recipe for yogurt and granola. What kind of jars do you use? I don’t like the bands, etc of canning jars. Can you freeze the yogurt mixture? I had left over pizza using your whole wheat recipe. It was great!! Soup! I tried making chicken and dumplings with the carcass of a roast chicken, and it came out bland and watery. So I soaked a bag of canilini beans overnight, brought the soup to a boil, and threw in the beans, and about 4 cups of kale. Much better. Another option is to have yogurt and add some rolled oats and a handful of nuts and berries if you like! It is a quick and easy breakfast and also very filling and nutritious. I love to use yogurt, frozen fruit thawed, a little honey and your granola! It’s sooo good!